To see paintings close up on the National Gallery's website, use the zoom tools next to the paintings. Examine Ingres' "Madame Moitessier" in more detail. View Degas' "Combing the Hair" close up. On most websites you can click on the pictures to see larger versions and find out more. Discover ways to look at, think about and respond to art with fun online activities. Contains hundreds of works of art from the world’s major collections, including the National Gallery in London. Superb illustrations are combined with fascinating, informative text. Includes a timeline, biographic details of major artists, and an extensive glossary of key terms. Internet links to recommended websites including games and activities and hundreds more works of art. 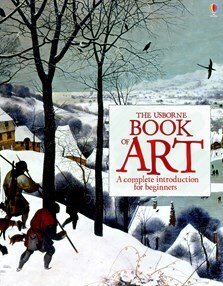 This book contains the following Usborne titles: Introduction to art and Introduction to modern art. I thought this book was amazing, full of great information for anyone interested on this topic.